I'm using a Moto G6 with Launcher 10 and it's almost as good a Windows phone as my 920 was. The camera isn't as good and the Google assistant is lacking compared to Cortana, but I now have access to any app I want. Here's what the Launcher 10 start screen looks like. Many of the tile update like live tiles. I think any Android phone with stock android, is the way to go for us ex-WP/WM junkies. Especially if you're coming from WP. Stock android has less bloatware and runs smoothly. Also consider getting a phone with 4 or more GB RAM. It just makes everything smoother. I fully agree with this! A lot of phones now have at least a 64GB option available. I learned to pay the extra for larger internal storage and skip the SD card completely. I recently bought a OnePlus 6T, and I got the 256GB version. Android has problems with SD cards, and Windows phones have problems with SD cards. The only reason the iPhone doesn't is because they don't do SD cards. I have come to believe that Apple was right all along. WP7 didn't support SD cards at first to maintain integrity. 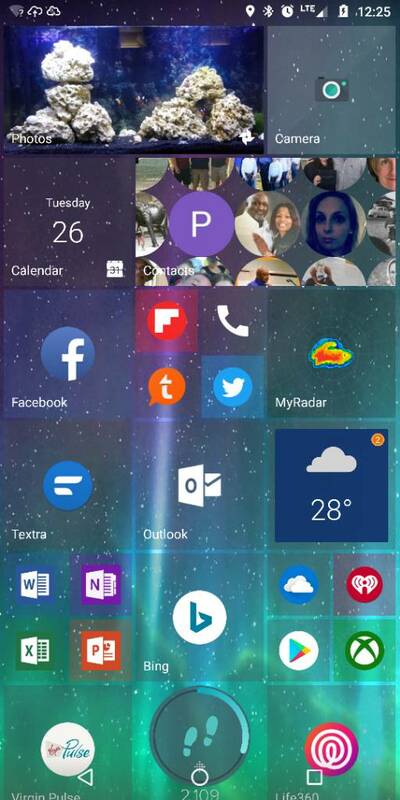 I think a good Nokia with Windows Phone Launcher would be a good experience. But the best is having a true Windows Phone. Here I am with my 950! Laura Knotek, raycpl and Guytronic like this. I'm still using a 950, fortunately. It's my third because I'm very active/careless: two have suffered cracked screens, one did not survive. I also purchased a Sony XZ1 Compact last year while I was between 950s. I decided to keep the Sony and use it regularly to play music through my home stereo's (Aptx) Bluetooth, and occasionally my car's. It is running the Microsoft Launcher, is my back-up phone, and will be my go-to phone (if and) when my 950 stops working satisfactorily. As for SD cards, I have always used them satisfactorily in the 950, and have one installed in the Sony as well. The 950 has a Sandisk 256GB card and it holds 70-80GB of owned music, Spotify, pics, apps, etc., and works fine with OneDrive. The Sony has a Samsung 128GB card and holds the same owned music and also works with OneDrive. I mostly use Groove to play my owned music on the 950, and VLC to play files on the Sony: both apps can play my WMA lossless files that some others won't. I'm using nokia 7.1 with launcher 10 and it is like my dream Windows Phone. Lumia 830(930) user here, they were great, but now gone. Android one with little personalization is the Best choice imo. ven07 and Elky64 like this. What are those problems? I was glad for the SD card slot on my Lumias and Galaxy S7, and wish I had it on my new to me Pixel 2 with 64GB built in. Actually, there are a lot of phones in the market which comes in everyone's budget. So it's totally on you that which phone comes in your budget. Nowadays people are buying Redmi Note 7 and Redmi Note 7 Pro, because it comes in their budget. If you can afford a flagship phone then you should definately go for OnePlus 6T otherwise. Last edited by anilrawat673; 04-05-2019 at 01:35 PM. There are a lot of Android Phones which are very famous for their prices. If you want a phone which comes near $200 then you should definitely go for Redmi Note 7 series otherwise if your budget is a bit higher then you should definitely go for OnePlus series. Can't ever recall having issues on Android w/MircroSD cards. Windows Phone occasionally with it usually getting sorted after a soft/hard reset LOL... not an issue with cards themselves as they were/are, always fine when using them elsewhere. P20 Pro with Launcher 10 and all the extra Android and EMUI stuff feels like what windows phone should have been before it was ended. Using it makes me see that windows mobile was so much more behind than I realized. I had a 950xl previously and a 925, 720, 630, HD7. Came from the Palm Pre originally. Only thing I miss are actual live tiles that keep me informed without opening apps. Notifications seem to be nonexistent on my phone as well. Not sure if I accidentally turned something off. Last edited by jfivieght; 04-11-2019 at 03:43 PM. Where's the best place to buy a NVIDIA GeForce GTX 1660 Ti?